← Christmas on Greek Street. 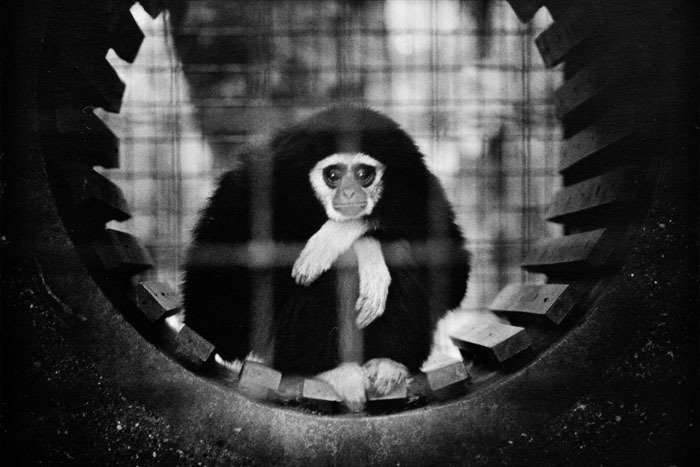 Lar Gibbon, Zoo Series, London 1992. © Britta Jaschinski. An otherworldly darkness permeates Jaschinski’s work, a troubling philosophical depth that touches both the animal inside the frame and the human spectator who is outside looking at the creature. A sense of uncertainty resonates in her photography—uncertainty about the animal’s context, the animal’s sentience, the animal’s feelings. This sense of the unknown challenges the human audience’s habitual expectations of omniscient insight with regard to other animals. I believe that it is wrong for us to see the monkey in the way we are seeing it, in a zoo, or even in a photograph from a zoo, and yet it is at the same time mesmerizing. Is this lar gibbon as fascinated by his spectators as we are of him? What does he think of us? We cannot know. The energy that Jaschinski’s image conveys is at the same time profound and profane. The longer we regard this gibbon, if we learn anything, it is how much we cannot know. Our relationship with non-human animals is rich, intricate, and troubled. People are fascinated by animals, and respond to them in ways that are at times full of homage and awe, and at other times oppressive and perverse. We are prone to appreciate, or to fetishize, animals in isolation as discretely framed specimens (in a zoo, or as a pet, or a meal, or a toy) distanced from their groups, alienated from their contexts. But still they are there, all around us. What is wrong here? What is missing? Where is the viewer situated in relation to the subject? What is the connection between imagining and exploiting animals? What has the photographic aesthetic done – and what have we done – to capture, and to betray, these creatures? What are these animals doing as we look at the sliver of their existence that is frozen and framed in the moment of each photograph? What kinds of movements, instinctual urges, behavioral patterns are suggested in the picture? And more to the point, what sorts of movements, instincts, and behaviors are suppressed in these images? A large “negative text” pervades Jaschinski’s photography. We are asked to see many things – habitat, activities – that are not there; we are confronted with their absence. Zoo by Britta Jaschinski is published by Phaidon. Very odd that you are promoting this series NOW. The book was published in 1996. Why not promote some NEW talent?! Good morning. The London Column’s remit is 1951 to now; and since the site started in May we have endeavoured to offer a mix of old and new. We had Andy Sewell’s wonderful Hampstead Heath pictures on here in August, and I have powerful essays by young photographers Alex Hocking and Manuel Capurso coming up. That said, I am keen to have younger photographers on here – and should you have any pictures or essays that you would like to submit, feel free to get in touch: thelondoncolumn@gmail.com. Best, David.